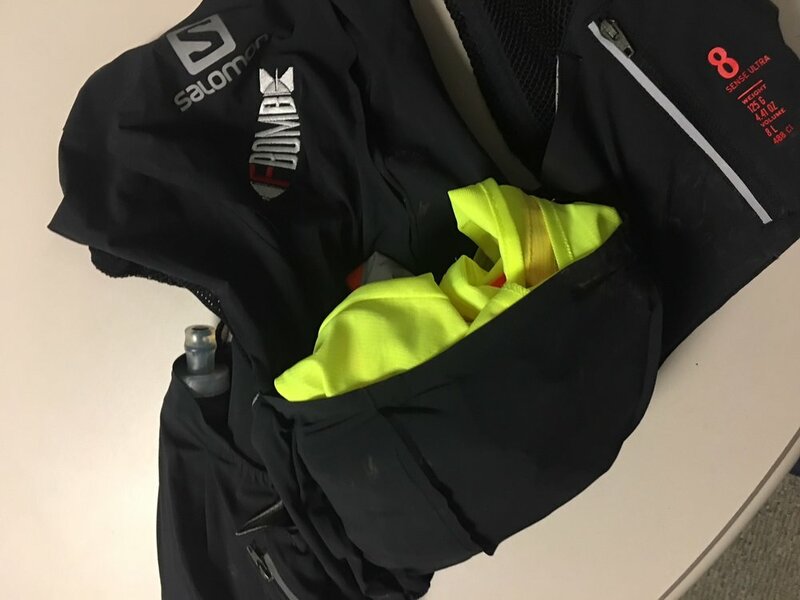 The Salomon S/Lab Sense 8 vest is the vest that I am currently using in races and training. I have at least one race in this (at the time of posting) and I have logged a couple hundred miles in it. There is a lot to love about this vest and Salomon has done a pretty good job with it. My vest also has an FBomb logo, this is not standard on Salomon vests or gear. So lets start with what I really like about this vest. The accessibility of the storage. It's easy to get in the water bottles in the chest and access the other storage while on the run. The pockets are flexible and stretchy, so you can stuff a lot of things in them and it won't bounce that much. I have used it to stuff hat and gloves, as well as trash from my FBomb packs. The vest is light. The material makes it feel like you're wearing a shirt...it doesn't feel like you're wearing a vest. Pocket/storage placement. There are so many different pockets and storage options and they are located in places where it's easy to reach and access while running. Even the pocket on the back is easy to store a layer/light jacket or an additional soft flask/gels/snacks. 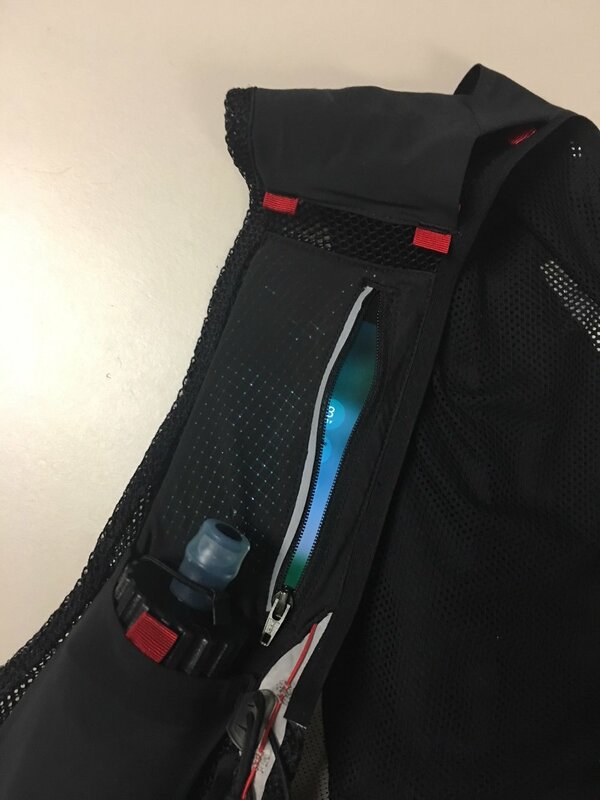 Large rear pocket can accommodate larger layers or smaller hydration bladder. I have used a 1.5L bladder, but I could also feel it...maybe 1L might ride a little better. There really isn't a whole lot that I don't like about this vest, but there are some minor issues. Salomon products are high quality, but they are the skinny jeans of running gear and clothing. Everything runs slim...think heroin chic. Again, not really a big deal, but as a husky runner, you might want to get a size up. The tightening loops are not adjustable and can be tricky to cinch down. I'm also concerned with how durable they will be. I have to double loop mine to get a tighter fit and it's putting a lot of stress on the plastic piece that you loop around. This really might be my only valid "Con" or issue/concern with the vest. Because the material of the vest is "stretchy", I would like to move the location of the adjustment points a little higher. It would make for a little better ride, but this is just personal preference. IPhone 7 in the cell phone storage pocket. It will zip close, but it is a tight fit and hard to access while on the move. It is also not waterproof. The Salomon S/Lab Sense 8 is a great hydration vest. It is on the expensive side retailing around $170. Being a little late in the season you might be able to find it for a little less. The downside to the vest, for me was the lack of being able to adjust the chest closure, but I have also figured out a work around for that. It hasn't showed any signs of breaking, but I am concerned with the durability of the plastic piece that holds it together. Time will tell on that one. Not having waterproof storage for a cell phone isn't really a big deal. There really aren't any hydration vests out there that offer that as a feature. I just use a zip lock bag and that works fine. The size of the cell phone pocket isn't really an issue either because there are so many storage options on it. There are a lot of reasons to like this vest and for me, it would work for experienced runners and racers, as well as those getting into ultra-running/trail running. I don't think it would be a smart investment with obstacle course racers though. It is definitely light weight, but because of that, I don't know how well it would stand up to the demands of crawls, sliding, rolling, etc that happen during an OCR. All things being considered and if I used a binary rating system, with 1 being yes and 0 being no, this would easily be a 1.